In my post on the Wisner hearing I noted that Sharonda Williams, New Orleans City Attorney, made an argument to Judge Zeno that there was no need for the Wisner Trust Advisory Committee to serve as an oversight body to how the Mayor spends the Wisner funds because there is already a check and balance system in place. 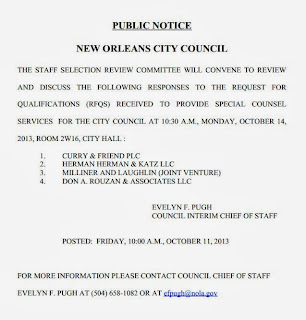 She suggested that oversight body is New Orleans City Council. I found it to be a specious claim the moment I heard it but apparently Judge Zeno took her word and granted the Mayor full control of the City's portion of the Wisner funds. In fact, he apparently took the city attorneys' word on everything, even going so far as cutting and pasting part of their counter-motion into his own "judgement". That cut and paste job was just about the only explanation he provided in any of his rulings which gave Mayor Landrieu practically everything he asked for. I was pretty sure the City Council claim was a smoke screen when I heard it but I wanted to check and see if City Council members were aware that the Mayor's office considered them to have any oversight with the City's portion of the Wisner funds. I spoke with two City Council members about the issue, Stacy Head and Susan Guidry. Councilperson-at-Large, Stacy Head, told me she had looked into the matter back in February and had asked the Assistant Fiscal Officer to the Council, David Gavlinksi, to do the same. I think what he's saying is the law states City Council does have legal oversight but it was never actually put into practice. Soooo...note to City Council: The Mayor is ultimately subject to the oversight and approval of City Council on all matters regarding Wisner. In fact, his lawyers just made that exact argument in Zeno's court. They claimed that they shouldn't have to answer to The Wisner Trust Advisory Committee because they are already legally bound to answer to City Council....Zeno agreed. The problem is City Council had no idea that they were responsible. At least the two At-Large members on the Council didn't know, as evidenced in this email chain. Nor did the third councilperson I spoke with, Susan Guidry. I'm not criticizing the council members in any way for not knowing this, they are elected officials that came into their jobs following the practices of the council members before them. The modus operandi and annual budget agenda never included a breakdown of The Wisner grant money. complete Council authority in the past. Apparently, the issue never came up until now. Regardless, once again, here's a note to City Council: YOU ARE THE OVERSIGHT BODY. In fact City Council is now the ONLY oversight body. The Mayor's counsel just lobbied this admission in a court of law....and the judge agreed. I suppose the person we should consult is the Special Counsel to the City Council. I'm sure that appointee could provide an objective legal opinion on the matter, eh? Because whoever holds that position would not be privy to the mayor in any way, eh? 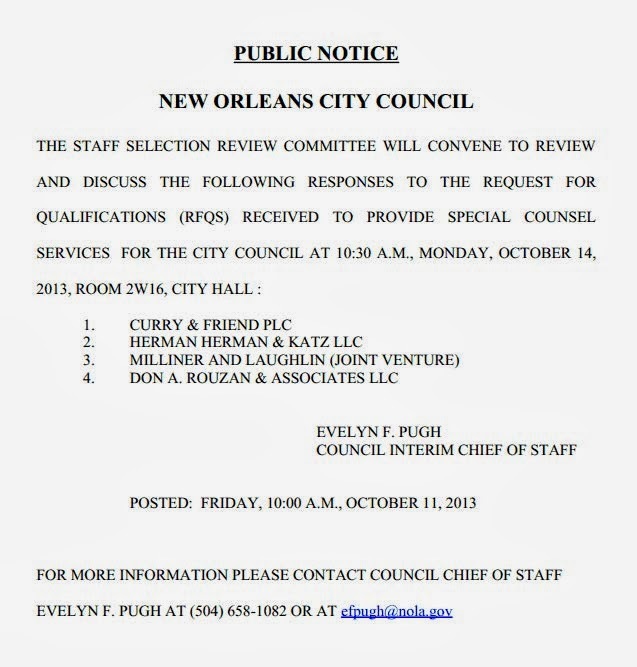 As luck would have it, the City just accepted RFQs for that position and four law firms applied. I'll give you three guesses as to who one of those firms is and the first two don't count. ....no....no conflict here.....Where's that Uddo or Zeno opinion when you need it?